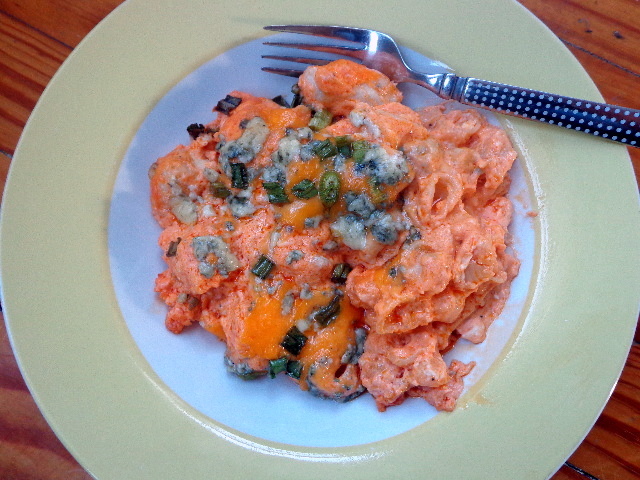 When I made this dish I was not planning on sharing the recipe (I just really wanted Buffalo Chicken Mac and Cheese!). But then it tasted so good. This recipe is not, I repeat not healthy. But it is tasty, yummy, cheesy, spicy, decadent, comforting, and delicious. Also, it’s easy. Using cream cheese as the base means you don’t have to worry about scorching milk while you try to make a cheese sauce. Have vegetarians coming for dinner? Skip the chicken. It’s sounds sacrilegious to true wing fans but I promise the macaroni can support the spicy goodness all on its own. Preheat oven to 350 degrees Farenheit. Prepare a 8×8 inch baking pan with cooking spray. Melt butter and oil over medium-high heat in a large skillet with a lid. Add chicken cubes to skillet, cover and cook 3-4 minutes on each side. Remove cooked chicken from pan and reduce heat to medium. Place cream cheese, ranch dressing, and Buffalo sauce in skillet and cook, stirring frequently, until combined. Add all but a handful of the cheddar and stir until melted. Remove skillet from heat and stir in cooked chicken and pasta. Pour mixture into baking pan. Top with blue cheese, remaining cheddar, and green onions.